Hilton Head Island is a place of many well kept secrets, and we aren’t just talking about the many stores and restaurants tucked behind lush subtropical vegetation. We also have a treasure trove of artistic outlets just waiting to be discovered. One of my personal favorites is the Arts Center of Coastal Carolina, located mid-island in the Shelter Cove area. It is where Broadway meets the beach, producing shows featuring today’s Broadway stars acting alongside our own incredible local talent. Hilton Head is home to many former and current Broadway performers, directors and musicians, who have actively shared their knowledge and talent with the local area youth and theater community with master training and workshop experiences. The result of this top notch training makes it nearly impossible to tell who is fresh off the boards of New York and who is fresh off the beach at Coligny while enjoying one of the Art Center’s spectacular shows. The Arts Center is known for their well-rounded theatrical season that includes crowd pleasing musicals, local performance groups, international dance and musical companies, children’s theater, and intimate murder mystery or dramatic performances. Just coming off the smashing success of their productions of Mary Poppins and Dirty Rotten Scoundrels, this local is ready to stand in line for my ticket to their upcoming holiday treat White Christmas and next summer’s Mama Mia! Andrea Gannon, Vice President of Marketing for the Arts Center, says the upcoming Million Dollar Quartet is a must see show. 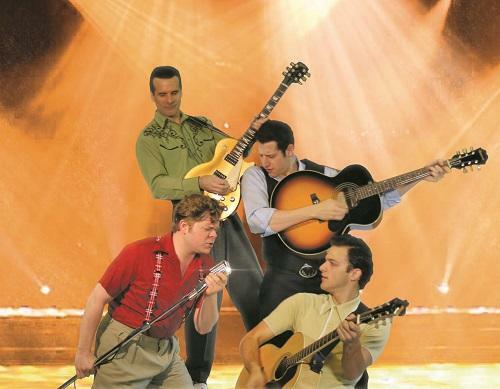 This musical is based on a once-in-a-lifetime night in rock n’ roll history that happened on December 4, 1956 when Elvis Presley, Jerry Lee Lewis, Johnny Cash and Carl Perkins came together to make music that would become one of the greatest impromptu jam sessions ever. Million Dollar Quartet is the Tony Award-winning Broadway musical inspired by the true story of this famed recording session that was held at the now-iconic Sun Records recording studio in Memphis, Tennessee. Tickets are on sale now and the show runs June 21 through July 30, 2016. The Arts Center is located at 14 Shelter Cove Lane, Hilton Head Island, SC adjacent to the entrance to Shelter Cove Harbour. The theater main stage house seats 349 with a smaller black box venue for youth and experimental theater. Visit the Arts Center website to see a full list of performances and ticket prices or call (843) 842-ARTS (2787).